Cary, NC – Nov. 23, 2015 – The strong response to INDA’s recently completed Filtration® 2015 Conference & Exposition confirmed the high importance of the growing segment of nonwoven media for air and liquid filtration. Some 1,500 delegates attended the premier global filtration event, Nov. 17-19 at Chicago’s Navy Pier. The educational seminar drew the highest attendee count in recent years, demonstrating the industry’s interest in learning more about the latest in filtration. Among the highlights was the keynote presentation by Armando Brunetti, Executive Vice President, Camfil Americas. Brunetti spoke to a standing-room only audience about business trends in a presentation on Who Are Our Customers and What Do They Really Need? More than 140 exhibitors participated in the event and reported high-quality business connections were made between customers and suppliers from around the world – all in one location. “Filtration 2015 was the first time Sterling Nonwovens exhibited in the U.S., and in particular at a focused filtration exhibition. In the first four hours of the exhibit, we were inundated with visitors to our booth, who at this stage appears to be genuine enquiries and opportunities to further our business aspirations in the U.S.,” said Julian Bickford, Managing Director, Sterling Nonwovens. Speakers at the Conference also included leaders from DuPont Protection Technologies; GE Water and Process Technologies; Nederman LLC; Mann+Hummel Innenraumfilter GmbH & Co. KG; and W.L. Gore & Associates Inc., among others. Conference topics focused on Cutting Edge Technologies, Industrial Air Filtration, Filtration Solutions and Filtration Trends and Statistics. 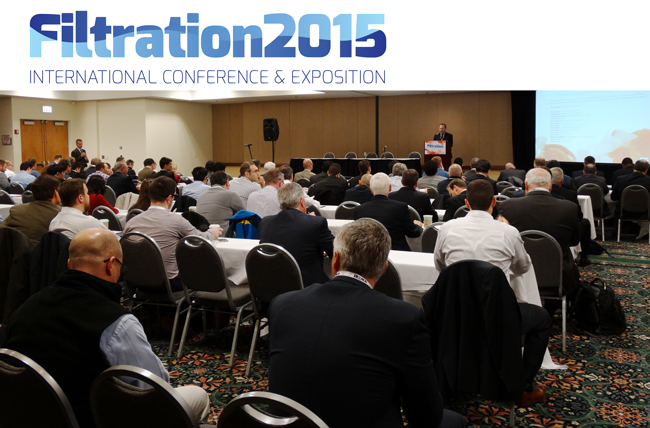 INDA also announced Filtration® 2016 will be held Nov. 8-10, at the Pennsylvania Convention Center, Philadelphia, Penn. For information, visit www.inda.org.